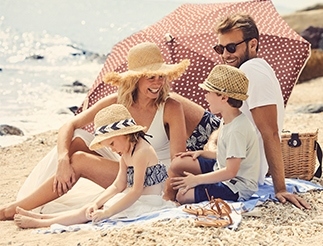 IHG® (InterContinental Hotels Group) has curated the ultimate in Easter escapes these school holidays, with a line-up of family-friendly packages, experiences and super savings from Sydney’s city all the way to the cherry blossoms of Japan. Each experience has been designed to unlock the heart of the city with exclusive access to family attractions, or limited-edition dining events for the Easter period. Explore below for the pick of the pack from the world’s largest luxury hotel brand, InterContinental Hotels & Resorts, and every family’s favourite, Holiday Inn. Dive into the ultimate kids fairy-tale: glamping inside a hotel room. Holiday Inn Melbourne on Flinders has partnered with Temple & Webster to create the glamp-in package in time for the Easter school holidays. Each package includes: overnight stay in the exclusive Temple & Webster Glamp-in setup, complete with a tee-pee, blankets, toys and books which have been designed for kids of all ages; buffet breakfast for two adults (kids under 12 eat and stay free); set of exclusive Holiday Inn Chatterbox Conversation cards to take home, and a $20 voucher for the Temple & Webster online store. Pricing & availability: available on Friday, Saturday and Sundays only; email reservations.melsf@ihg.com or phone 03 9629 4111 for pricing and to book. InterContinental’s Head of Pastry, Chelsea Logan, has added to the hotel’s program of immersive dining experiences, this time giving high tea a magical overhaul in time for Easter. Special Easter highlights include white chocolate bunnies, an Easter egg caramel tart, deconstructed carrot cake, lemon meringue tart and a hot cross scone served with Pepe Saya butter. Both kids (and kids at heart) can don their aprons in the pop-up egg decorating station, complete with a candy dessert buffet, to create their own masterpiece this Easter. The palm-lined pathways of InterContinental Sanctuary Cove Resort will become a playground of fun and refreshment these April holidays with a jam-packed line-up of activities for families of all ages. Best of all, all activities are free for children and families staying at the Resort. The one-acre beach lagoon and marine lawn garden will play host to many of the activities, with highlights including beach soccer, jewellery making classes, ‘Games by the Grass’ with giant chess, giant Jenga, putt-putt golf and table tennis, cupcake making classes and the Resort egg hunt on Easter Sunday. Personalise your Sydney experience these Easter holidays and tailor-pick your stay, your way. Designed to unlock the best of the Sydney surrounds, the Family Getaway includes overnight accommodation for 2 adults and 2 kids, full buffet breakfast for the family, valet parking and late check-out of 1:00pm. Every package includes a family-fun attraction – and the choice is yours. Experiences include: SEA LIFE Sydney, WILD LIFE Sydney, Madame Tussauds or Sydney Tower Eye. Price & availability: from $250.00 per night; 2-night stay package; kids under 12 eat and stay free. T&Cs apply. Little travellers will meet the Easter Bunny in the fur throughout the Easter long weekend, 19-22 April. A dedicated pancake decorating station will be set-up during breakfast over the long weekend, with special help from the fur bunny, including meets and greets and chocolate eggs and treats being handed out. Kids under 12 also stay and eat free throughout the school holidays. IHG has also released its Easter offer across Australasia and Japan, offering up to 35% off stays booked from now until 26 April. For the first time, nine incredible hotels across Japan join the Easter offer, opening the gateway to picturesque laneways in Osaka, Shinto shrines in Kobe or historic monuments in Hiroshima. Other international escapes include New Zealand with breathtaking stays in Queenstown or the waterfront surrounds of Wellington. Visit here for full terms, conditions and offers.